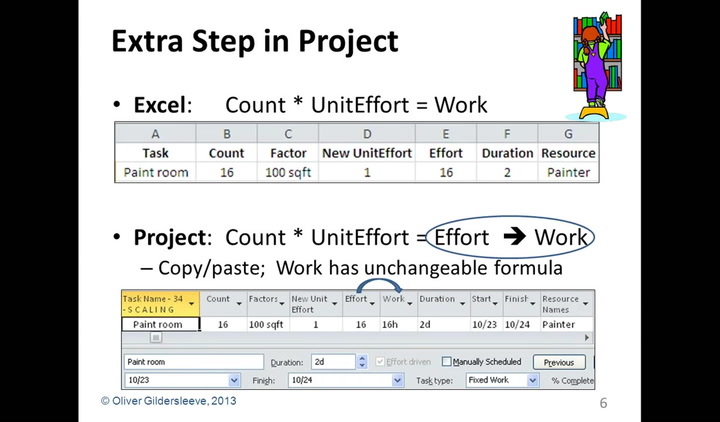 Microsoft Project can be turned into an estimating tool that includes uncertainty and continuous improvement. Unfortunately, many estimate task duration’s from the recollections of one or more persons. Better is to re-schedule a past project as it should have occurred, producing Work estimating data. Then, for a new project, scale that data according to the size of the tasks to be performed. With all tasks set to Fixed Work, when resources with Assigned Units are applied to the new project’s tasks, their duration’s and the project’s product delivery date result. For continuous improvement, during the execution of new project(s), Actual Work can be collected as tasks complete. Good records can be used to improve estimating data that is retained in a schedule template. The use of a schedule template greatly reduces subsequent planning effort, and resulting schedules have consistent vocabulary, structure, and estimates. Participants will see an easy path to developing estimates based on facts. The techniques close the loop between project tracking and subsequent estimating. Implementations may be judged as CMMI level 5, Optimizing. Relying on data defends against arbitrary cuts in estimates. Bids on fixed price opportunities become much less risky. More and more projects succeed. Oliver works remotely for DRC, a contractor providing project management support for government agencies. Previously he was with Franklin Templeton and J&J’s LifeScan, for both of which he was the single point of contact with PriceWaterhouseCoopers and their planning and estimating tool. When withdrawn from the market, he adapted and expanded those techniques and teaches them in courses for The Project Management Institute (PMI)® chapters in San Francisco, Silicon Valley, and Monterey and for San Francisco State and UC Santa Cruz. Weekends he teaches sailing for Club Nautique on San Francisco Bay and makes sail kits for Porta-Bote International.